First of all, I want to wish all the A-Z participants the best of luck. It is definitely going to be tough, but it is also going to be a lot of fun. 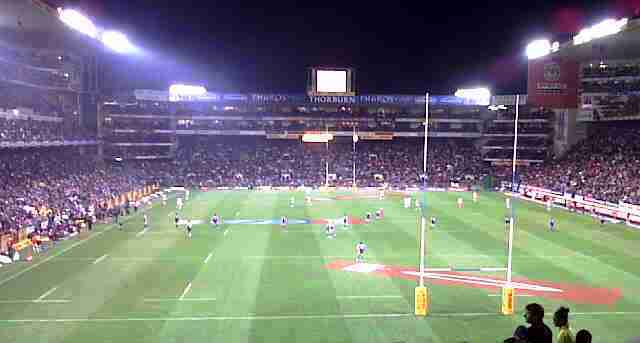 Then, on another note, my family and I went to Newlands today to go and watch a rugby game and the experience was wonderful. 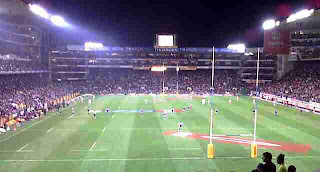 Unfortunately my team, The Stormers, lost but it was a good game. I even got to see my favourite player Rynhardt Elstadt in action, even though I didn't manage to get an autograph or anything. It was just one of those really unforgettable experiences. I did not think that it was possible but I am still changing and evolving. I thought that when I became 25 that I was now set in my ways and that my personality was fully developed and that would be that. At 27 I now realize that I don't know everything about myself and that I am still learning what I like and don't like. Not to mention that I am confusing myself these days. I used to be the kind of person that would just go with the flow and adapt and try my best to fit in and not ruffle any feathers, but at my new job I am finding it hard to fit in and I am making no attempt to adapt. I am myself and simply refuse to conform. I know that is very selfish of me, but why can other people be their rude and obnoxious selves and I have to be the one who constantly smiles? Why can't I be the workaholic that doesn't like making conversation unless it is work related? I am starting to like being on my own more and more and sharing an office with a women who constantly needs to chat is not helping matters. My taste in the kind of novels I read and write have also changed. I am not sure for how much longer I will be writing romance novels. I have become an even stricter vegetarian and the thought of ever going back to being a meat eater is now out of my mind forever. On another note, I have written at least one post for the A-Z challenge and planned ahead for the others, but I have yet to write them. But what about you guys? How are things with you? It feels good to blog again. My life has been crazy and not the good or fun kind. Work has become a much bigger part of my life and is demanding more of my time than I would like, but I am trying to push through, especially since jobs are so hard to come by in the first place. I did it, I signed up for the A-Z challenge, even though I haven’t written one post to date and I know I should. I refuse to miss out on this experience again this year. I missed out last year due to work commitments and won’t do it again. I just have to think of what to write and how I am going to manage to visit blogs. But do it I shall. My writing is going nowhere at the moment. I start something and then I don’t finish it, I just move onto the next idea, which you guys know is nothing like me. But I am sure I will figure something out. What you are you lovely people up to? Got any news for me? I am so ecstatic because I have just been awarded another award, The Liebster Award and this time I have the awesome Jai from And then…to thank for this honour. Thank you! 1. 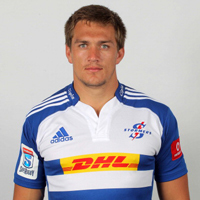 Thank the blogger who presented you with the Liebster Award, and link back to his or her blog. 2. Answer the 11 questions from the nominator; list 11 random facts about yourself, and create 11 questions for your nominees. 4. 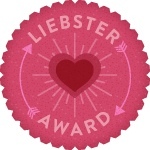 Upload the Liebster Award image to your blog. 1. If you could have a super power what would it be? Neither, because both stain my teeth. Black or grey, anything dark. I wanted to meet people who like writing as well and to share my writing with someone. 5. Who was your favorite teacher and why. One of my college lecturers, because he genuinely cared about my future. 7. What kind of music do you enjoy? 8. Do you have a favorite movie? 9. What would be your dream vacation? My family and our pets spending time together. The location doesn’t matter. 10. What is your favorite healthy food? My sister’s chef salad with lots of fresh vegetables. I love potatoes and fried things, not to mention that I have a terrible sweet tooth. 1. I tend to have a very short temper. 2. I can be really impatient. 3. Most days I like animals more than people. 4. I tend to be a loner. I don’t know why, but I like my own company. 5. I tend to worry about things, small or big. I am just a natural worrier. 6. I have completed four books to date, but only one is in submission condition. 7. I am afraid of people. 8. I can be a bit paranoid at times. 9. I don’t make friends easily. 10. I just recently started reading Stephen King’s books and I absolutely love his writing. He is rather straight forward, which is refreshing. 11. I listen to rock music to help me think. Something about the style of music is rather calming to me. I know how crazy that must sound. Now, my 11 questions to the reward recipients. What is the worst job you ever had? If you could be any animal, which would it be? Do you include exercise into your daily routine? I don’t know about you, but at times I feel I can do with a bit of cheering up and because life is so particularly hard, I have a few quotes to make us all feel better. All quotes can be found on www.brainyquote.com. Have a great week everyone. I am sorry, I know that I have not been very supportive and that I have been missing a lot of important events in your life. I promise I will try to do better and be a better blogger friend in the future. I am really sorry that I have not been making the rounds and offering my support.